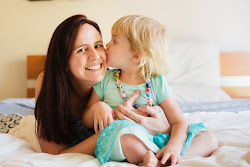 Today I welcome back Benita - teacher and friend from my online FB Mother's Group (and loyal follower of Teacher Types). Benita joined us last year and shared her amazing Outdoor Kitchen. Since her last post, Benita has welcomed her second child, Miss H and is kept very busy with her two girls. 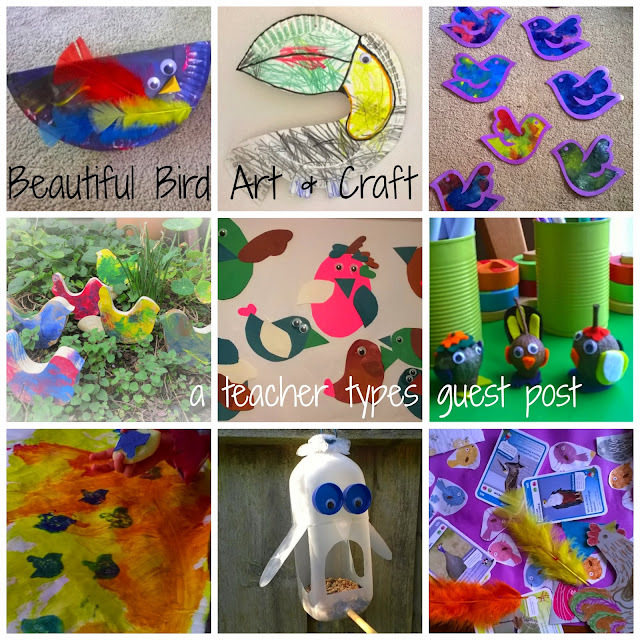 Benita is here to share some beautiful bird art and craft she's been doing with two year old Miss E to keep her entertained while she's busy with bubs. “More birds, more birds” is what breakfast with my 2 year old sounds like. Currently she is loving anything crafty and everything bird (or concrete mixer) related. So today I thought I’d compile some of our bird crafts into a little recipe book for any other little bird enthusiasts out there. And birds are such a wonderful thing to want more of really. First on the list is of course the paper plate rocking bird! I love crafting with paper plates, they’re thick enough to withstand large blobs of paint, glue, and most manhandling a toddler can throw at them, and they’re inexpensive and easily customised. • Paint, or textas/crayons if you’re not up for the potential mess of painting. 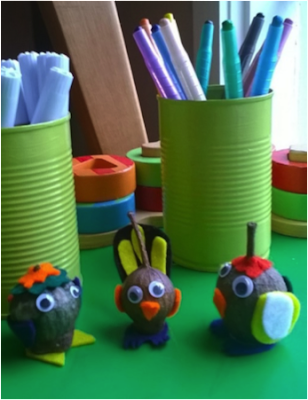 Paint/colour your plate, when dry fold in half and let your little person add feathers, beak, eyes, etc. 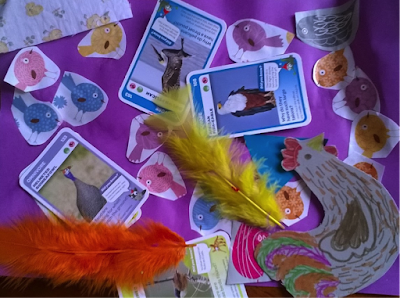 This is a good opportunity for counting out feathers, eyes etc and discussing what each body part is used for and perhaps how some birds differ depending on how ‘educational’ you want to make it, or what time of day it is. Yep another paper plate bird! Thought we’d introduce another really different type of bird, so we read about toucans in our visual dictionary and whipped up this one. Cut a long shape out of the centre of your plate so your toucan has a gap between his back and beak –this piece becomes his tail. Trim around the edge of the plate to give him claws and to shape his beak. Attach the cut out as the tail –stapler. 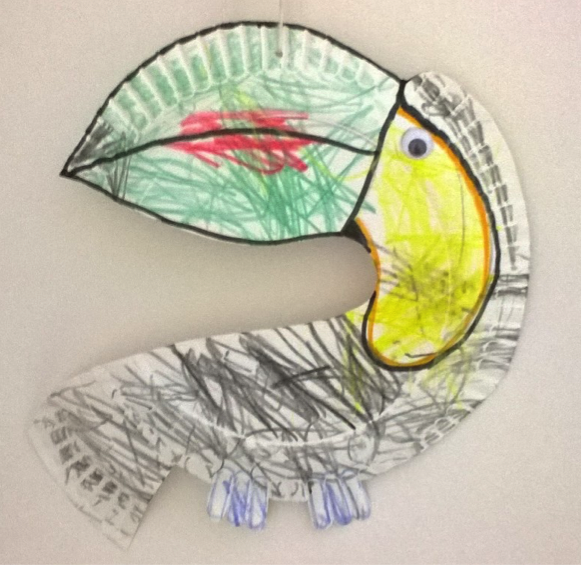 Colour your toucan and give him an eye –Done! Cut your bird outlines from your paper and stick them to the contact. Have your little person paint on the sticky side of the contact, it doesn’t matter if they paint over the outline. When the paint is dry stick another layer of contact over the paint so it is sandwiched inside the two layers of contact. 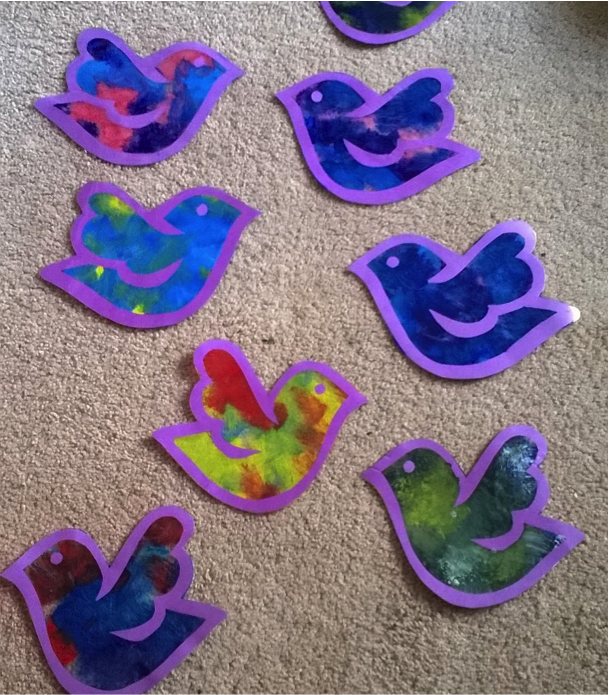 Cut around the edge of your paper outline and hang your beautiful birds in a sunny window, or even on a white wall they’ll look lovely! • Wooden birds either thick enough to stand alone and play with, or thin wooden craft shapes if you want to use them as part of a larger craft project later or simply attach a magnet and pop on the fridge! 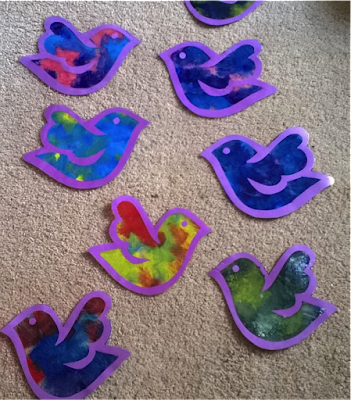 I cut birds for my daughter as she asked for them, so we now have 15 wooden rocky birds nesting around the house as well as various thin ones used for magnets and framed for Mother’s day gifts etc, but I imagine most of you doing this craft will buy your bird shapes, and then simply pull out some paints and let your kiddo go! We did some in water colours, some with acrylic craft paints, some were painted with our fingers, some with cotton buds, some with paintbrushes, we scratched texture into some with sticks while the paint was wet to make ‘feathers’, some we even pressed onto the table while the paint was wet and lifted them again which was totally unplanned but made a beautiful feathery texture on the wood. If you are varnishing or adding magnets etc do this once the paint is fully dry. 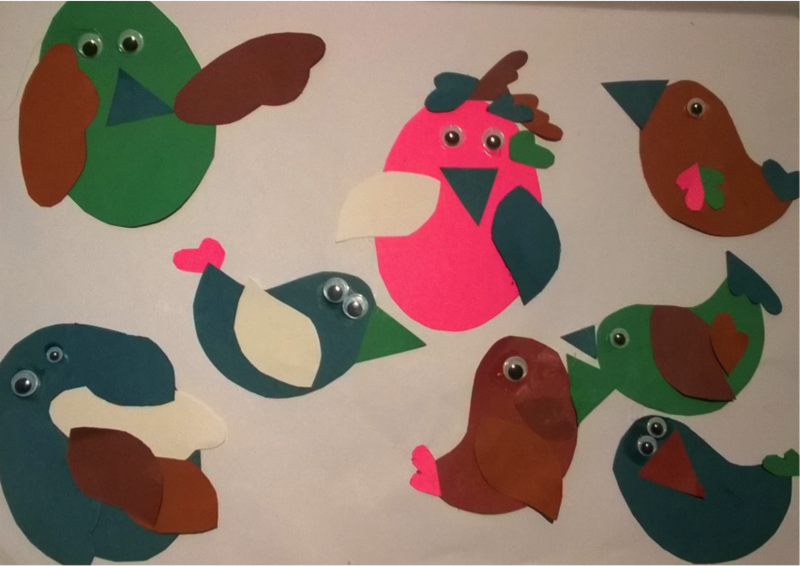 Let your little person build their page of birds! I was quite surprised that despite some birds having multiple tails on their heads, some being covered in wings, some having two eyes on the side of their heads, all her birds were quite bird looking! Quirky and with personality, but definitely birds. − What colour bird will you make next? − Where are you going to put his wings? − What will this bird be doing? -Is he going to be a flying bird or a sitting bird? − How many eyes does this bird need? − What colour tail do we want to match/contrast with this bird? − How big should this bird’s beak be? My daughter doesn’t have the language to actually voice answers to any of these questions as she has only just started talking, but they definitely got her thinking about where and how she wanted to make her birds. 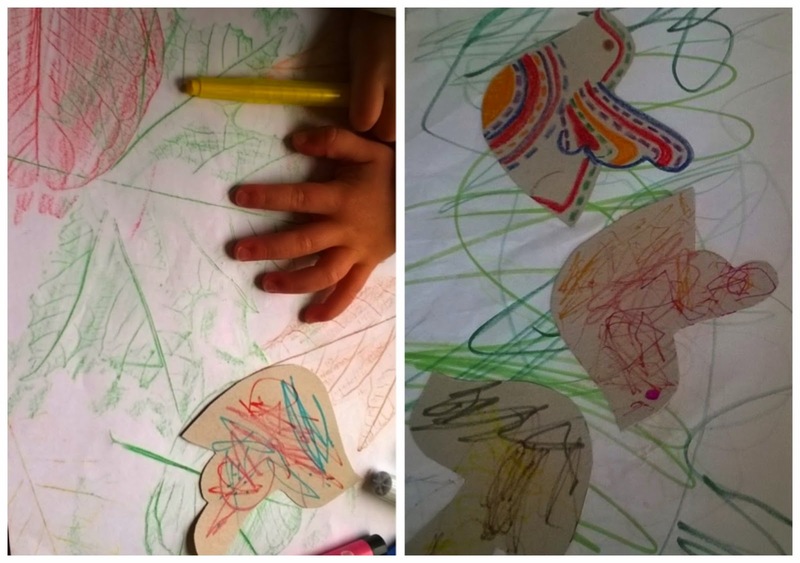 For older children you could add more pieces.. legs, nests, leaves, branches, feathers, etc. Go for a walk with a bucket for collecting interesting bits. Assemble your birds! Let your little person do as much as possible! Halve your potato and using the knife carefully cut your bird shape. 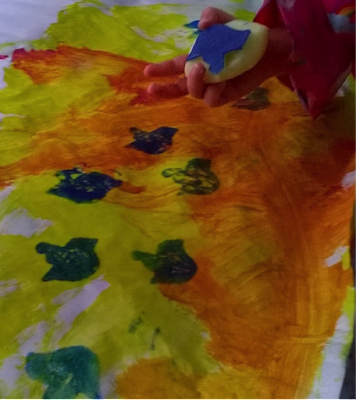 Apply a thin layer of paint to your stamp and let your little person go! We did our stamps in a contrasting colour onto a fairly plain painting she’d done the day before. We didn’t paint our bird as we didn’t have any waterproof kid friendly paints. Cut wing and belly holes in your ‘body’ leave wings attached to give some weather protection to the seed. Use your glue gun to attach lids as eyes and accent with googly eyes for effect. We cut our beak from the tummy piece. Poke your stick in through some holes and fill with seed. Attach to a fence or tree and wit for all those birds! • Anything bird related that can be pasted to a piece of paper! • Bird pictures, feathers, egg shapes, bird cards you’ve got lying about from the recent Woolworths promotions, egg shells…..
Multimedia art making is always lots of fun, let your kiddo go wild and make some kind of collage with all these bird related bits! Think you have no supplies to make birds? Go through your recycling and find some cardboard, a cereal box perhaps..
Hopefully this gives you a bird idea or two to take away and create! Thanks so much for your fantastic ideas Benita! There's definitely a few on this list I'd like to try. 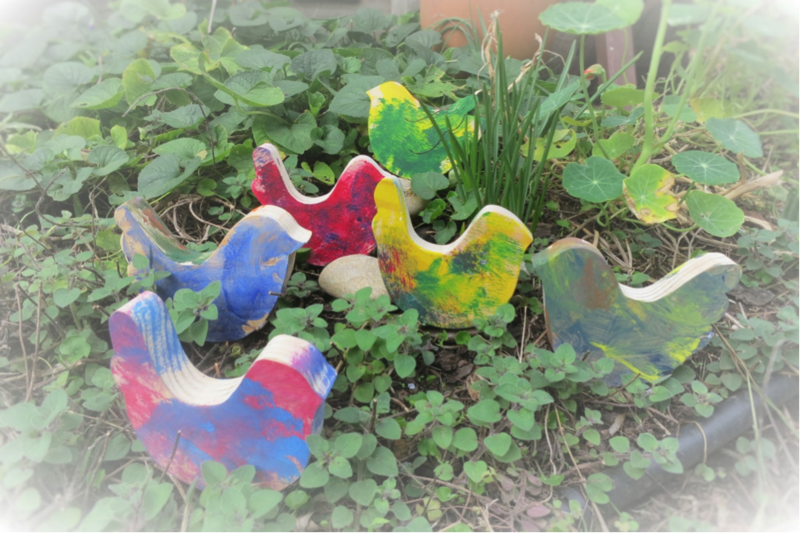 You can find Benita's beautiful hand crafted wooden puzzles here at - Little Bird in a Beehive. Some gorgeous ideas here. 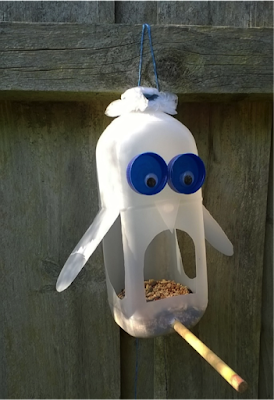 I especially love that bird feeder, so clever!